Marriages are different in the southern region of India as compared to North India, be it love marriage or arranged. Tamil and Telugu people constitute the significant population of South India, and they are known for their simple living and high caliber of education. If you want to see marriages full of Indian customs and traditions, then attending Telugu & Tamil weddings are a must. Marriage is the most critical spiritual symbol of the Tamil community. It is characterized by fun moments with family, attendance of distant relatives and lots of traditional food. But there is a lot in life after Kalyanam or marriage. And an essential part of marriage is managing your relationship goals. With the increase in inter-caste marriages in India and even in Tamil and Telugu families, many marriages fail after a few years of marriage due to lack of love, too many fights, and cultural differences. Marriage is just the beginning of a new life, and there is a lot further. Marriage without love is like a flower without fragrance. But in most marriages, love seems to disappear after a few years. No one wants to have a nasty married life filled with arguments and tension. But after marriage, the proportion of love continues to decrease and of arguments continue to increase in most cases. 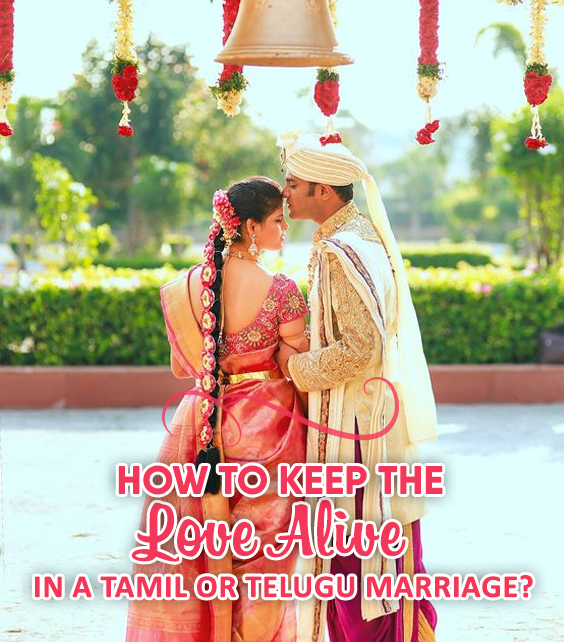 Let us consider some aspects that will help you keep your love alive in a Telugu or Tamil marriage! Acceptance: Acceptance is the base of respect, and if you respect each other and your cultural and family differences, then you can go a long way ahead. Accepting each other should not be based on mere words, and it should show up in your actions too. As joint families characterize Tamil or Telugu culture, you should be ready to accept and respect each other’s families and relatives also. Clear communication and realistic expectations are an essential part of accepting each other. Develop Friendship: In the South Indian culture, mostly the bride and the groom are both educated and at times, working individuals. They might be in the same profession too. It is crucial to develop an attitude of friendship amongst couples to gain confidence in each other. Just like you share your secrets and good times with your besties, if you do it with your soulmate, then you will have a lot of trust and understanding in your married life. Friends do understand each others’ perspectives and stand beside each other in difficult times, and if you share your day with your partner, you will have the same trust in your relationship too. Compatibility: Tamil matrimony or Telugu matrimony involves a lot of compatibility tests before the family finalizes marriage. You must take the time to understand each others’ values, interests, and goals. This will make you more comfortable with each other. Do Not Stop Dating: Most couples end spending time with each other after marriage and get involved in their routine life. This is the biggest mistake they can make. It is quite common in South Indian families because, in big families, responsibilities are many. Even holidays and dinners are generally with the entire family. This kills the spark between the couple to some extent. So, take out some time and steal some privacy. Try to impress each other, have fun, love deeply and laugh with each other. You can even date your beau at home. So, bring the romance back into your life. Share Your Responsibilities: As both husband and wife are working in many modern South Indian families, it becomes difficult to handle personal as well as professional lives effectively. This leads to arguments and fights that can eventually bring an end to your married life. Do not overburden your partner with familial responsibilities. Share the work at home and enjoy spending time with each other while doing the daily chores of the house. Even responsibilities of the kids can be shared. This can be an excellent way to build your relationship stronger. Give Some Space: Married couples stay together, but that does not mean that they should invade the personal space of each other. After marriage, your partner need not be with you at all times, emotionally and physically. Give enough personal space and freedom to each other so that your love can blossom effectively. Forgive and Be Forgiven: Arguments and fights are a common thing in every marriage, especially in the initial years till you get used to each other. But if you want to keep the fire of love alive in your hearts, then you must learn to forgive each other. It is not necessary that you would always be right. Also, winning an argument is not going to get you any reward. Holding grudges over small arguments and petty matters can kill your relationship. Listen: The art of listening is entirely different from hearing, but few people understand it. Understand the verbal and non-verbal meanings of your spouse’s words. Take the time to understand his/her life and health conditions and expectations. If you want a vibrant marriage, then you should listen more than you speak. Have A Daily Dose of Love: Love and kindness is not meant for birthdays and anniversaries alone. You can celebrate every moment of togetherness and love between you. Do not leave your kindness and affection for special occasions. Giving small gifts to each other, even chocolate or a rose can bring a smile on your partner’s face. The more you love your partner, the more you will receive. So, light up your passion and have a dose of love daily. This entry was posted in Wedding Tips and tagged tamil brides, Tamil marriage, tamil marriage tradition, tamil matrimony, telugu brides, telugu grooms, telugu marriage, telugu marriage tradition, telugu matrimony on October 24, 2018 by TSILV.